Health care leaders addressed pivotal questions about “Medicare for All,” the Affordable Care Act, health care delivery in the Americas, and disruptive technologies at the Miami Business School’s eighth annual Business of Health Care conference, “Technology & People, U.S. & Beyond,” on March 29 at the Watsco Center. The heads of six leading health care provider, insurance and business organizations agreed that neither “Medicare for All,” defined as a single-payer system, nor the dismantling of the Affordable Care Act (ACA) are the best approaches to address health care access and affordability. The recent move by the U.S. Justice Department not to defend the ACA in the courts, creates greater instability within the health care system that could drive up premiums and other costs, panelists said. Instead, they agreed that lawmakers and the industry should focus on fixing the ACA and providing universal health care coverage. “We should be talking about universal coverage, rather than relying only on the federal government for reimbursement,” said Maryjane A. Wurth, executive vice president and COO of the American Hospital Association. “Let’s strengthen what we have – the Affordable Care Act – and move on." John Quelch, vice provost, University of Miami and dean, Miami Business School, welcomed more than 900 health care executives, physicians, consultants, and students to the sold-out event, whose sponsors included Florida Blue, Boston Scientific and Vitas Healthcare. “Every year our conference attracts outstanding leaders, regionally, nationally and internationally,” Quelch said, noting that the school is celebrating the 40th anniversary of its health care executive MBA program, which was recently ranked #1 in the nation by U.S. News & World Report. Both professional and student attendees gave high marks to the conference. “It was very valuable in addressing the issues relating to U.S. health care policy, physicians’ practices and consumer trends,” said Gema Milanes, a broker with AON insurance. Bethany Franz, a graduate student in the school’s Master of Health Administration program, said importance of social determinants on the overall health of the country was another key point from the conference. Costly investments in electronic medical record (EMR) platforms are adding to providers’ burdens, according to panelists Matt Eyles, president and CEO, America's Health Insurance Plans; Joseph Fifer, president and CEO, Healthcare Financial Management Association; Halee Fischer-Wright, M.D., president and CEO, Medical Group Management Association; Ernest Grant, president, American Nurses Association; Barbara L. McAneny, M.D., president, American Medical Association; and Wurth. Latin America and the Caribbean face both the health care challenges of advanced economies, as well impoverished communities, said Frenk, who moderated a panel discussion on “The Role of Government in Health Care Around the World” with three of the region’s ministers of health. “Technology is a key potential driver of positive transformation, but you need to have everything around, including the right people and the ethical context,” he said. Pillay pointed to the rapid pace of innovation in smart phones and wearables that allow consumers to monitor their health and perform diagnostic checkups rather than visiting a primary care provider. Other notable advances include gene editing to prevent disease, 3D printing of corneas for transplants, and exoskeletons that allow paraplegic patients to walk again. “Brain interfacing with computers or robots will be science fiction brought to life,” he added. Machine learning and artificial intelligence (AI) can help providers overcome their cognitive limitations and make decisions based on sound evidence, Pillay said. However, AI’s ability to draw conclusions based on comparing images will impact specialties like dermatology, radiology and pathologies. 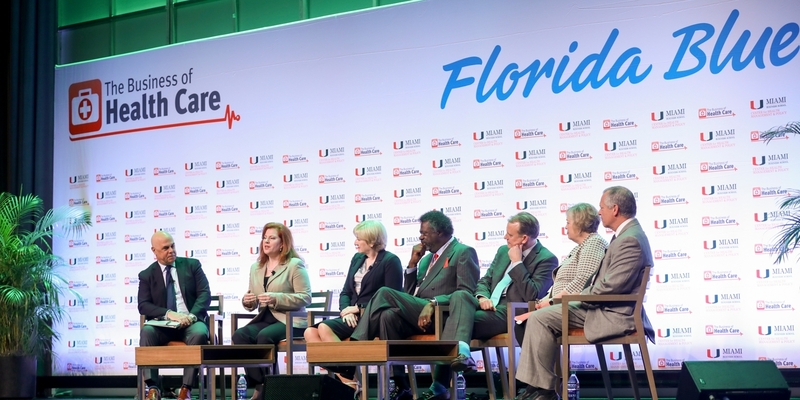 Edward Abraham, M.D., CEO, UHealth – the University of Miami Health System, kicked off the conversation by noting that the implementation of an “Open Table” approach to patient appointments has improved patient access and the overall experience. Ed Martinez, SVP and chief information officer, Nicklaus Children's Health System, said the digitization journey has focused on engaging and informing patients and families. “One of the game-changers for us was digitizing the discharge process, including a ‘doctor’s note’ for children who missed school,” he said. While technology can help with transitions of care management, caregivers still need to provide education and emotional support, added Brian Holzer, M.D., CEO, Lacuna Health, in Louisville. The last panel on “Technology, Trade, and the Global Health Care Business Climate” focused on investment trends and was moderated by Richard Clarke, senior fellow and clinical professor, Department of Health Management and Policy.